WASHINGTON, D.C. (Inspiration Mars) – A unique window of opportunity for humankind will open in January 2018, and the Inspiration Mars Foundation intends to seize it, announcing plans today to pursue a challenging manned mission to Mars and back. This historic 501-day journey around the Red Planet is made possible by a rare planetary alignment that occurs five years from now. Two professional crew members – one man, one woman – flying as private citizens will embark on what is known as a “fast, free-return” mission, passing within 100 miles of Mars before swinging back and safely returning to Earth. Target launch date is Jan. 5, 2018. “When nations boldly follow opportunities, rooted in curiosity and guided by technological innovation, they grow, prosper, learn and lead. And this is what makes a nation great,” said Tito, chairman of the Inspiration Mars Foundation. 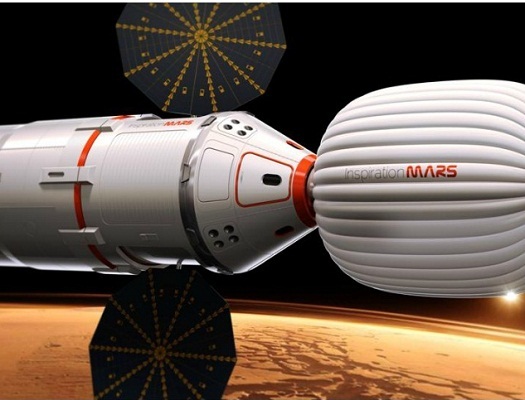 “Investments in human space exploration technologies and operations by NASA and the space industry are converging at the right time to make this mission achievable,” said Taber MacCallum, chief technology officer for Inspiration Mars. MacCallum is also CEO/CTO of Paragon Space Development Corporation, and was a member of the Biosphere 2 Design, Development, Test & Operations team, and a crew member in the first two-year mission. Those benefits include cutting-edge research and potential discoveries. The mission validates decades of taxpayer investment in NASA technology, and strengthens the nation’s position as a leader in exploration. It also serves as a vehicle for inspiring youth through science, technology, engineering and math (STEM) education and motivation. The foundation is already collaborating with nationally prominent educators, organizations and space experts to design a compelling educational K-12 program. The Space Act Agreement between Paragon and Ames is to conduct thermal protection system and technology testing and evaluation. Foundation officials will also seek to tap into NASA’s knowledge, experience and technologies to fine-tune and/or develop some of the more challenging elements of this mission, including environmental controls, radiation protection, and human health and productivity plans. The PRESS (i.e. the questions from the press) was, by far, the biggest disappointment in this event. The press has ZERO courage and ZERO respect for those with courage. I have never been so disappointed. GO Inspiration Mars and those that actually have courage. And to those idiots asking questions, please go home and sit on your hands and wait for your passing. That should be safe. Got to say I was thoroughly underwhelmed. Unless I missed something I think they revealed almost no solid details on the mission architecture and crucially didn’t clarify which capsule they were aiming on using. The design in that mockup looks like an orion capsule to me but I may be wrong? This event informed the public of the objective of the mission and not the how of the mission. For Tito to get the biggest bang for his philanthropic dollar I think he needed to take this step. Sounds like he will try to leverage competition and market forces to get the best deal on the components of the tbd architecture. Nice to see more than one potential provider of all the major components such as inflatables, capsules, and rockets. They may be able to instill some competition and perhaps some philantropic contributions from these providers. Remember this is a non-profit and not a government entity. So wise financial management is a critical success factor. crewed test flight by 2018 (2019 is optimistic, closer to 2021 is more likely), I think it’s safe to say that one’s ruled out. SpaceX is the only other party even saying they’re going to build a crew vehicle for beyond-LEO, so the only other candidates would be as-yet-unannounced projects that plan on going from zero to flight status in five years.